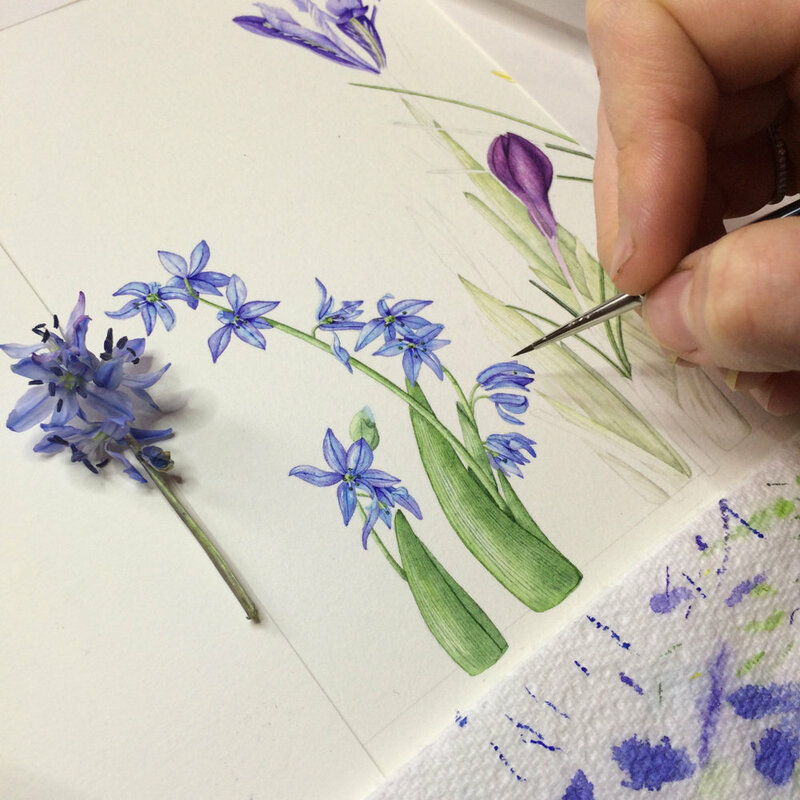 The second piece I painted for the Society of Botanical Artists Diploma Portfolio was a mixed floral piece. At the time all the spring bulbs were emerging in my Mum’s garden, and so my choosing my subject was an easy decision this time! I had a selection from: iris, crocus, daffodil, muscari, scilla, bluebell and snowdrop! The sketchbook work for this piece was quite labour intensive! With so many different specimens to study (at the same time!) I felt as though I was rushing through these preliminary studies, but with such a short time frame to do these pieces I didn’t have much choice! My focus was on getting the colours right, rather than on my technique at this stage. 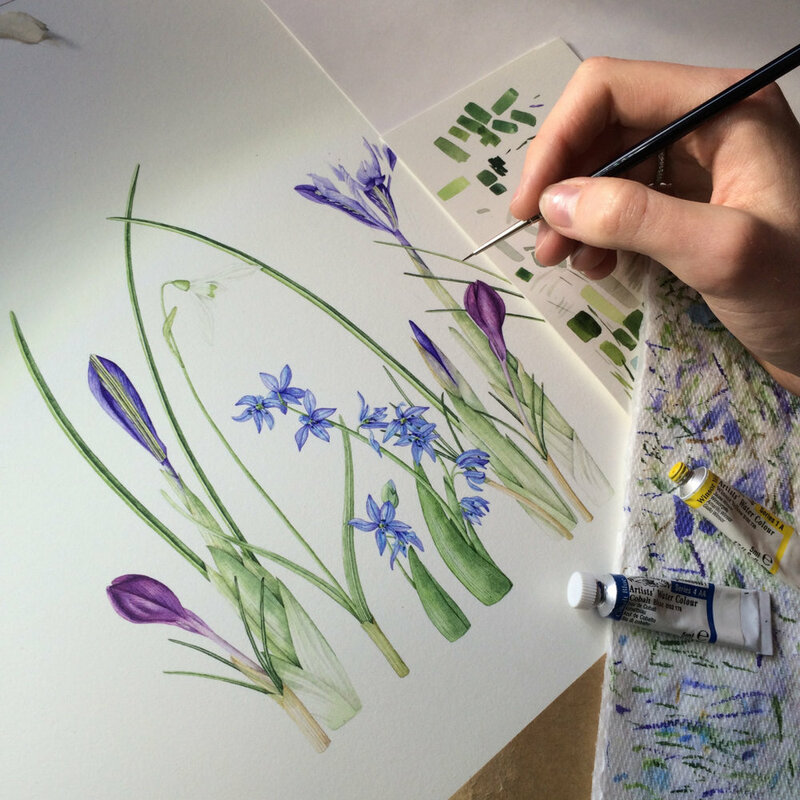 I knew before starting this piece that I wanted to give the impression of looking through a meadow into the flowers, rather than a traditional bunch of flowers, as that is how these spring bulbs are usually seen! To put this together, I drew each flower individually, then used tracing paper to arrange them on the paper. I was able to move things around and re-draw leaves as necessary to make a happy composition, and work out which flowers I wanted forwards and which I wanted further in the background. I really like this technique; it takes time, but it really is worth it to get a composition you are really happy with. I used a variety of techniques in this painting; some larger wet-in-wet washes as well as dry brush. 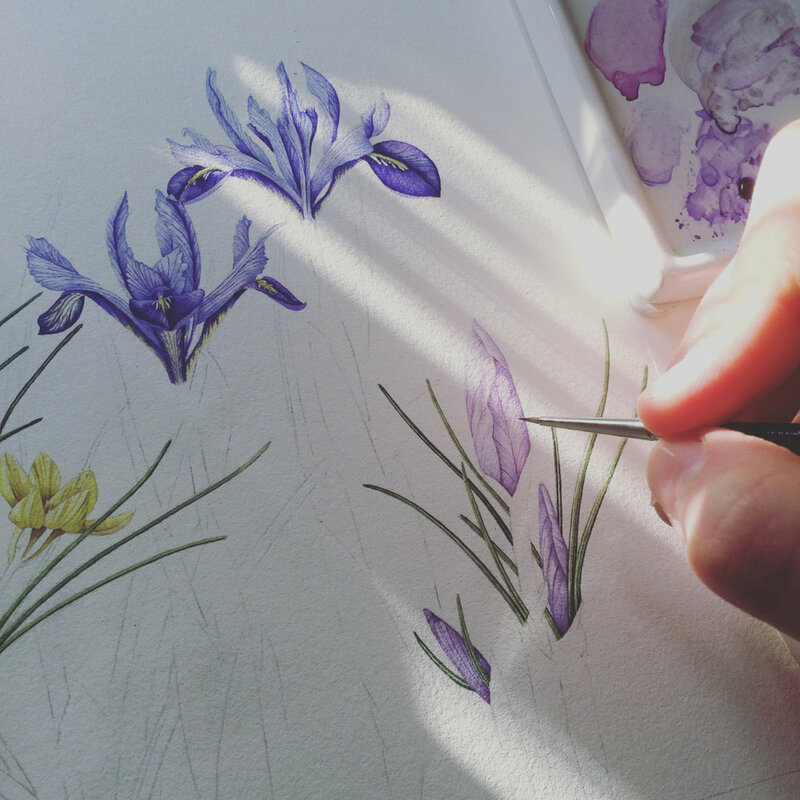 Dry brush was particularly useful on the long thin leaves on the crocus. I hope that gives you some idea about my process in creating this piece! Prints of these spring bulbs are available to buy here. Perfect to brighten up your wall.